Stop by a welding shop here and they will customize your motorcycle how ever you want it. Bring a couple different vehicle parts and they will weld it on for you! It’s pretty amazing to see the creativity some people have when customizing their motors. Often it is with large wood boxes to hold bread, produce, live chickens, just about everything. This custom front end is welded to a small Honda Cub. The blue bottles you see in front is fresh water. You can’t drink most of the water you find here so you have to buy it at a store. Transportation to and from a colmado can be a bit tough….. Unless you have customized your bike! After buying my Yamaha 125E I found that it is pretty hard to find a manual to work on it. It’s a little hard to trust most of the parts places that you find in the smaller towns in the Dominican Republic. Most pretty much go by a “if it more or less works, it’s good enough” philosophy. A manual increases your chances of getting the right part and getting the part installed correctly, even if you are just watching someone else do the work. 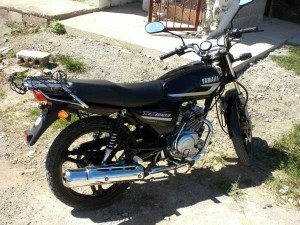 The Yamaha 125 ED is pretty popular in the Dominican Republic and you can find it at Yamaha dealers in most of the larger towns. It is a bit more expensive than the Honda Cub and even some of the 125s you see from Suzuki. Usually it is far more expensive that the Chinese manufactured bikes that are pretty popular here. However, I’ve ridden several of those other bikes and there is a very large difference in quality, this bike is taken care of will provide many more years of trouble free service than the cheaper bikes. I own a Yamaha motorcycle as well as a Yamaha Axis scooter. Part of owning and using a vehicle is the constant need for maintenance. Living in an area like the DR increases that need. Due to the humidity and in many locations near the ocean, salt in the air, things oxidize quickly causing electrical and mechanical damage. In addition to that the poor roads in the Dominican Republic can really take a toll on the vehicle whether it is a motorcycle or a car. These poor conditions mean constant maintenance and more frequent repairs that you would normally need in the US or other countries. When it comes to repairs and maintenance living here is both a good and a bad thing. Good in that many parts are considerably cheaper than you would buy in the States, bad in that most of the parts are of lower quality and trying to get people that actually have training to work on your vehicle is pretty hard. Most of the parts you find in the DR are aftermarket parts it is pretty rare to find OEM parts (I’ve yet to see any). This may or may not mean lower quality. Reading this article on OEM vs Aftermarket auto parts will give you a bit of an idea on the debate about that. One advantage is aftermarket usually means it will be cheaper to buy and therefor very popular here. Usually in the states you only go to a lawyer (abogado) for larger legal items. Here in the DR you will end up heading to the lawyer’s office for quite a few things. 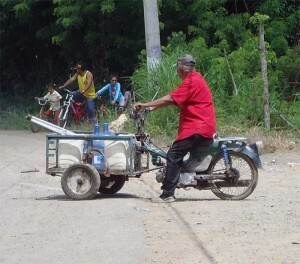 Two of the most popular scooters in the Dominican Republic are the Yamaha Jog and the Yamaha Axis. The Jog comes as a 50cc and the Axis as either a 90cc or a 100cc. While there may be other engines available for the axis, I haven’t seen them. If you read my previous article on Yamaha bikes you will find a recommendation to go with one of the larger wheeled commuter style bikes. I still recommend this to be a good idea if you are in one of the more crowded cities or plan on doing any traveling between towns. The reason I have been researching the scooters more is for my wife. The scooter does have some advantages, the main ones are that they are lower to the ground and so a little easier to control and they are lighter. These two advantages make these ideal vehicles for women just wanting a quicker easier way to get around town. And thus starts my search into the world of scooters. Something to consider if you plan on buying a bike in the DR is to pick up a security system while you are still in the states. You are going to be parking your motorcycle or scooter on the streets frequently and it is pretty easy to steal these smaller bikes. When parking my bike I always lock the front wheel (move the handle bars to the left and lock so that the bike can only go in circles if pushed), but that is only a deterrent. Two guys can easily grab the front handle bars and walk your bike down the street disappearing in a few seconds. For additional security if I am not in a area with a lot of people around I will run a bike lock through the back tire and over the seat to keep people from lifting the front tire and walking off. If you drive a vehicle in the Dominican Republic, by law the vehicle should be insured. Whether this insurance really does any good or not remains to be seen. When you rent a car from an agency the car is usually insured, the policy is a minimum policy that only covers the other person and the car, not your injuries. Another car insurance policy you might consider is a policy to protect you from being killed by the family if someone dies in an accident (No Kidding!). If you are on a “staycation” of a “holistay” in the DR and plan on buying a vehicle for your time here, you will want to purchase insurance in order to stay legal. This is pretty important because you car or motorcycle could be impounded if you don’t have the proper papers. More likely though if you are pulled over you will need to give the police officer a hundred pesos or so whether your papers (drivers license, vehicle license, and insurance) are completely in order or not. If you’re planning of staying in the Dominican Republic for an extended “staycation” you will probably in time want to get some sort of Motorcycle or car. After a while it does get a bit tiring walking or getting stuck in a public car with 6 other people. 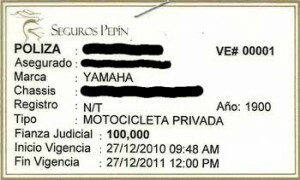 There are a number of different brands of motorcycle in the DR. Many of them you probably haven’t heard of. Of the major brands that are available Yamaha is one of the most popular. While you can buy larger bikes in the DR, most of the bikes that are sold here fall I the commuter class. Usually between a 70 and a 125 cc. You will also find a lot of smaller 50cc bikes like the Honda Cub. Larger bikes are usually found in the larger cities and are harder to find parts for than the smaller more common motorcycles or “motors”. Dirt bikes or endures are also sold here but the most common types of bikes are scooters (pasolas) and the commuter street bikes (motors). There are two styles of scooter found here, the less expensive small tired scooters and the more expensive scooters that use wheel closer to the size of a standard motor cycle. These scooters come in anything from 90cc to about 150cc, with the 90cc to 125cc scooters being the most common.